Instead of the traditional hot cereal breakfasts, such as oatmeal, I felt compelled and inspired to try something different after stumbling upon this Warm and Nutty Quinoa Recipe from 101 Cookbooks. I omitted the non-dairy milk in my most recent time making it and used walnuts instead of pecans. I also used blueberries and strawberries as my fruit toppings. My husband loves the simplicity of this meal. The crunch of the walnuts along with the sweet notes of agave and kick of the cinnamon make this a worthwhile breakfast endeavor. 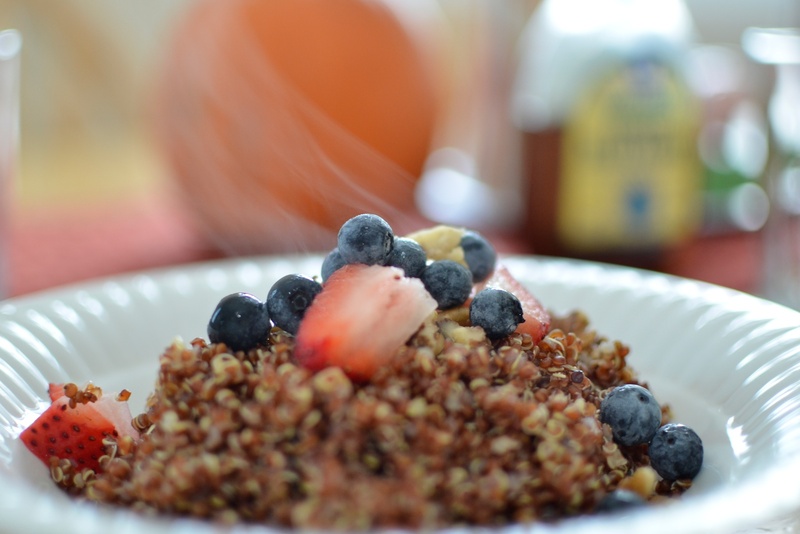 Red quinoa also has a rich, hearty, slighty nutty flavor and is packed with protein. Quinoa is also gluten-free to boot for those with sensitivities. Overall, we’d rate this dish a 5 out of 5 carrots on the veganlicious scale. In the words of Dead Prez in the classic vegetarian anthem, Be Healthy, “Lentil soup is mental fruit.” I couldn’t agree more! 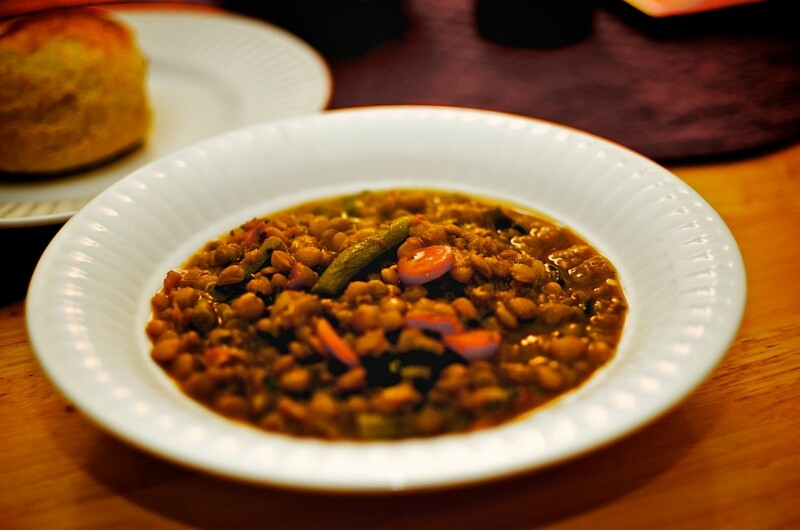 The quintessential fall/winter soup is lentil soup. Lentils are packed with protein and dietary fiber and do not have to be soaked prior to cooking (unlike other dry legumes). I based my latest lentil soup on this Allrecipes.com Lentil Soup recipe. I didn’t have celery, so I replaced it with fresh green beans from my CSA. Instead of using canned, crushed tomatoes, I cut up several tomatoes from my CSA and threw them into the pot. It was a simple, yet flavorful and filling soup. The touch of vinegar at the end added another welcome dimension to the complexity of flavors. This soup goes well with a mixed green salad and dinner rolls or crusty bread. Overall, we’d rate this dish as 3 1/2 out of 5 carrots on the veganlicious scale! Back in my pre-vegan days, I was a big fan of McDonald’s Egg McMuffins with Canadian bacon. When I used to go to vegan potlucks in New Jersey, I wanted to bring something to wow the crowd during brunch meetups. 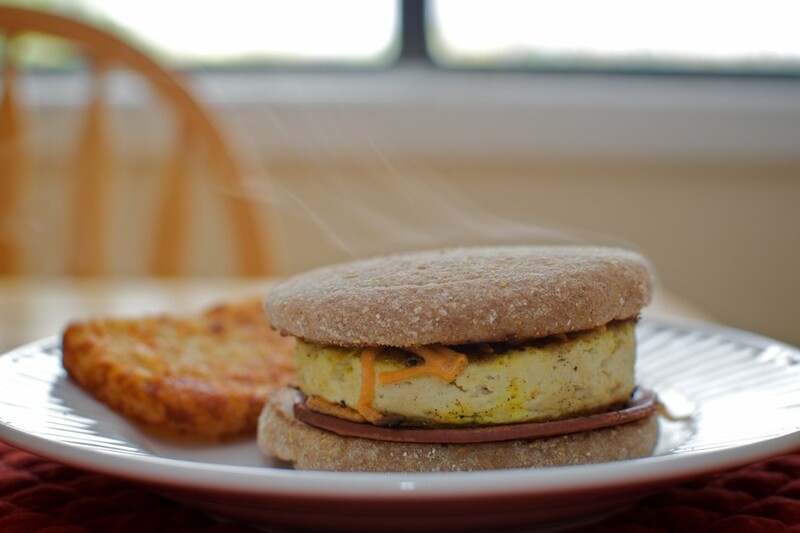 Making a healthier, cruelty-free Vegan McMuffin was easier than I imagined. Finding hash browns that looked and tasted almost identical to McDonald’s hash browns in the local grocery store was also easy to find. Slice the blocks of tofu into 3-4 sections each (approximately 1 inch thick or desired thickness). Using a round cookie cutter or glass, cut the tofu slices into circles. Spray olive oil on a heated skillet and place the slices of tofu on it to cook. Sprinkle turmeric on one side of each tofu slice to give it the yellow “egg-yolk” look. Spray olive oil on the turmeric-spiced slices. Flip over and cook the other side as well until it is slightly browned. When the tofu is almost done, sprinkle vegan cheese on each slice. You may want to use a lid to put over them to help with the melting process. Remove from the skillet when the cheese is done melting. Meanwhile on a separate skillet (or before you start the tofu if you only have one skillet), spray a little olive oil and place the sliced halves of the English muffins face down to become slighted browned (only on the inside though). Cook for a few minutes on low to medium heat and remove before they start to burn. When you have space on either pan free, warm up slices of the Yves Meatless Canadian Bacon. Since these are pre-cooked, they don’t take long to heat so watch carefully so they don’t overcook. When everything is cooked, assemble the McMuffin: bottom of English muffin, Canadian bacon slice next, then tofu with cheese, and lastly the top of English muffin. For the hash browns, just follow the directions on the back of whatever brand you buy. It’s usually easy to heat them up in a toaster oven or conventional oven. Serve everything with salt, pepper, and ketchup. The last two weekends we’ve had awesome vegan activist friends visiting us from out of town. One of my friends, Victor Sjodin, who works for Vegan Outreach, just got his website up where you can purchase UnFuck the World: Go Vegan t-shirts! Check it out. To fill their bellies and satisfy their palates, I wanted to give them savory and sweet dishes from one of my favorite cookbooks: Vegan Brunch by Isa Chandra Moskowitz. 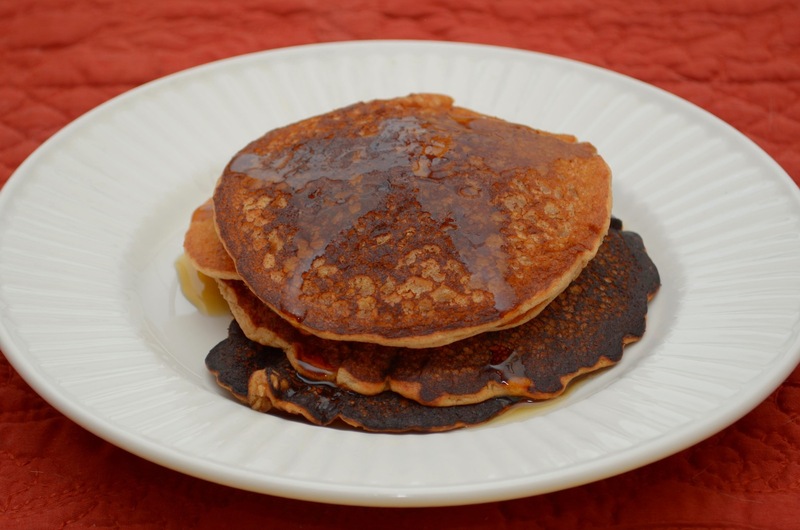 I made the Perfect Pancakes which are fabulous with a cinnamon twist! To make them a tad healthier, I used half all purpose flour and half whole wheat pastry flour as the base. 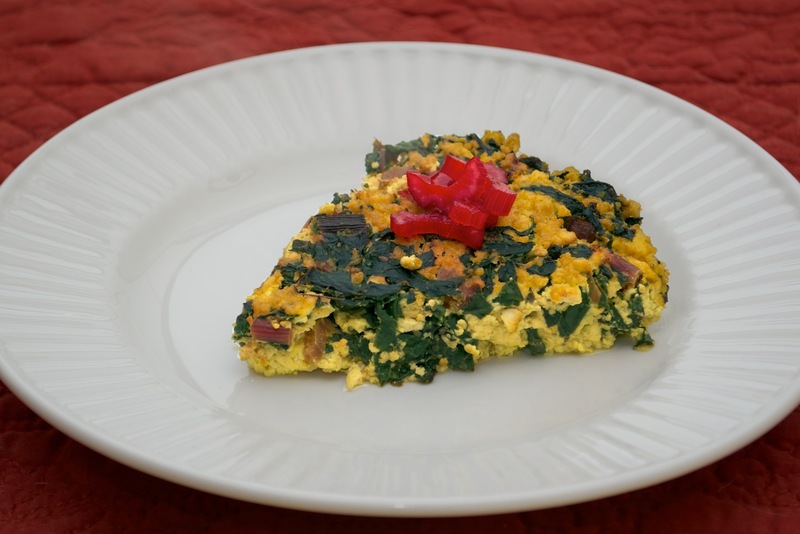 A wonderful complement to the sweetness of the pancakes with maple syrup is the Swiss Chard Frittata. The recipe can be found here on The Post Punk Kitchen. Both of these dishes have become a quick favorite of mine. Separately and together, these dishes are a perfect 5 out of 5 carrots on my veganlicious scale!